Liam Riley, a Wilfrid Laurier University postdoctoral fellow, has been awarded a prestigious Banting Postdoctoral Fellowship for his research on the interconnectivity of food security and gender equality in African cities. Riley will be hosted at Laurier through the Balsillie School of International Affairs (BSIA) and the School of International Policy and Governance (SIPG), where he is working with Jonathan Crush, Centre for International Governance Innovation (CIGI) Chair in Global Migration and Development, on several inter-related research projects. Banting Postdoctoral Fellowships, valued at $70,000 per year, are two-year postdoctoral awards designed to attract and retain top-tier postdoctoral talent, and to advance world-class research on the national and international stage. Each year, only 70 fellowships are awarded across Canada. Riley came to Laurier in 2014 as a Social Sciences and Humanities Research Council (SSHRC) Postdoctoral Fellow to work with Crush and the team of researchers investigating urban food security in the global south. Riley’s research stems from the studies he began while working on his master’s degree at Western University, where he looked at children’s issues in rural Malawi. “I was curious to know what issues mattered the most to the children themselves, and it was overwhelmingly obvious that food insecurity was central to the related problems of health, access to education, and having a sense of social inclusion,” said Riley. 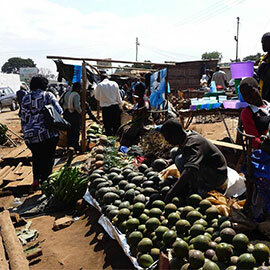 These studies led to his doctoral studies, also at Western, on gendered household roles in relation to household food insecurity in Blantyre, one of Malawi’s major cities. He says this project was inspired by an interest in what can be revealed about food insecurity by understanding the inner workings of the household unit and how gendered power dynamics shape who has access to food. “Intra-household dynamics are linked to structural causes of vulnerability to food insecurity, and reveal wider systemic barriers to both food security and gender equality in culture, environment, politics and the economy,” said Riley. Riley’s new research focus is on food access and gender equality when viewed at the city scale, framed in terms of the intersections among sustainable development goals for food security, gender equality, and sustainable urbanization. His primary interest centres on how the growing problem of urban poverty in Africa requires us to re-examine assumptions about the meaning of food security and gender equality in different contexts through dialogue with residents and leaders of these cities. This research will contribute to new theories of African urbanism and to innovative policy approaches to address urban poverty. Riley’s current research is aligned with two of Crush’s research projects: the Hungry Cities Partnership, which has partners in seven cities in the global south; and the Consuming Urban Poverty 2 project, which will focus on three secondary urban centres across Africa.